Hello ladies, hope you all had a lovely Christmas and ready for the New Year! 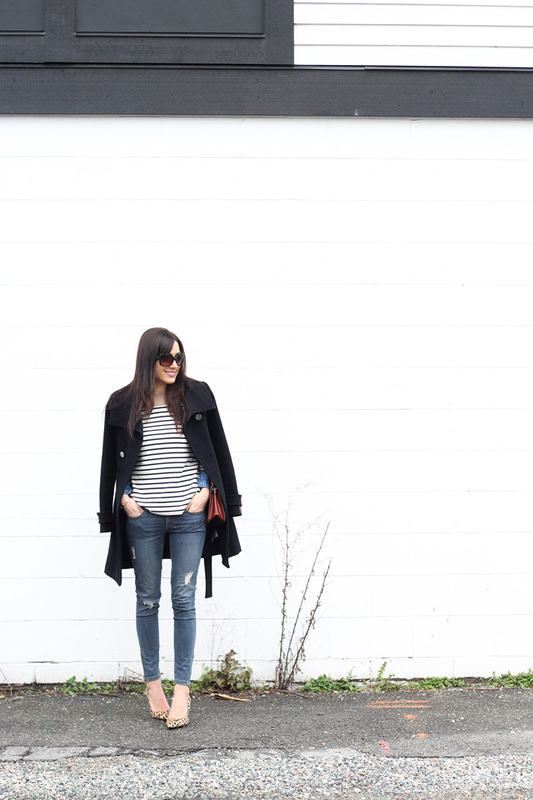 Today I want to introduce you to a subscription box company called Style by Portobello. If you're like me, you've always seen a ton of beauty box subscriptions flooding the web, but never come across one for vintage fans. So of course this one got me curious, given that I've always had a slight obsession for vintage accessories. So how does Style by Portobello subscription box work? Well, you have the option of choosing either to buy one box or a monthly subscription. One month you may receive a single stylish item and the next you may receive three one-off pieces. In my Bello box, I received this gorgeous camel leather purse. When it comes to styling vintage, I prefer to stick to one vintage piece per look and pair the rest with modern pieces. I styled the purse with my favourite pair of casual leopard heels, a pair of distressed skinny ankle jeans, a black coat, sunglasses, a gold buckle bangle, and a stripped long sleeve layered with a chambray shirt underneath for a more chic/edgy look. I wanted to keep my jewelry very minimal, so I added my new gorgeous gold bangle from The Peach Box. It was the perfect finishing touch. I'm very impressed with the overall quality of the bag and the detailing is exquisite. You can tell the bag was very well made. I also love that it's real leather, which is an added bonus, given that I try and buy leather bags as much as possible. Style by Portobello is a UK based company, but good news is they're now available to Canada & USA. All you have to do to sign up is go to www.stylebyportobello.com and fill out a style questionnaire portion, which allows the stylist to customize your package based on your own unique style. To get a better glimpse into the type of items included in past Bello boxes, you can take a look at their current gallery here. Don't be afraid to play around with vintage pieces and I challenge you all to bring a little vintage into your wardrobe, if you haven't already! *This review was done in collaboration with Style by Portobello & The Peach Box. However, as always all opinions are my own. This is such a great idea! I've always adored all things vintage and having a subscription box is so cool. You get a nice little gift every month like its your birthday! I also love your outfit here. 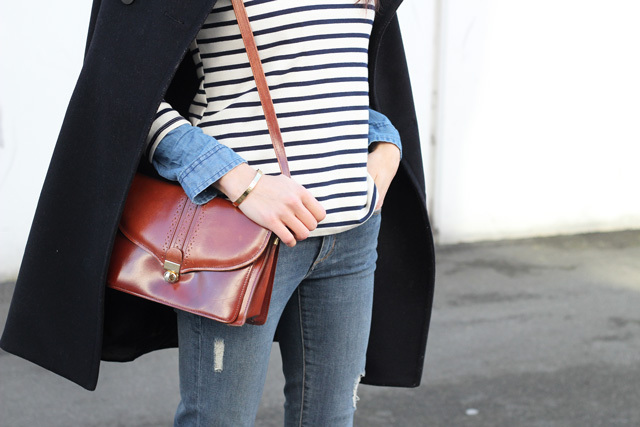 Stylishly classic and the bag is pretty darn fab! You look so chic. Awesome styling! Love your bag. 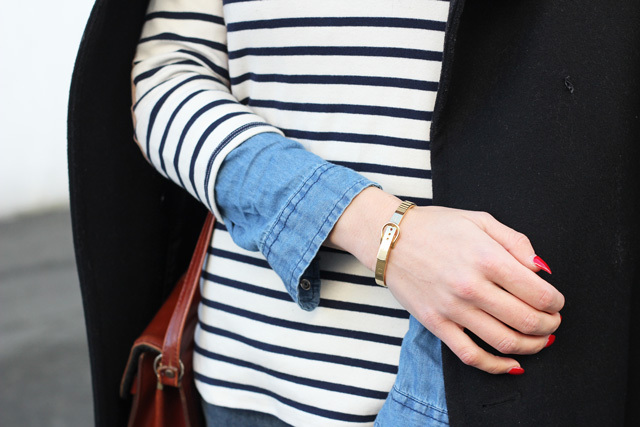 Love that gold bangle! I need to bring in more vintage pieces to my outfits! Love the look! I really like the details on your outfit with the demin shirt under the sweater. This sounds so great! I love vintage, but finding great items in vintage stores or markets is always such an adventure. Sometimes I love it, but most of the times it's just too much of a hassle. This is a great idea!! Happy New Year!! This sounds like a great subscription for the vintage lover. 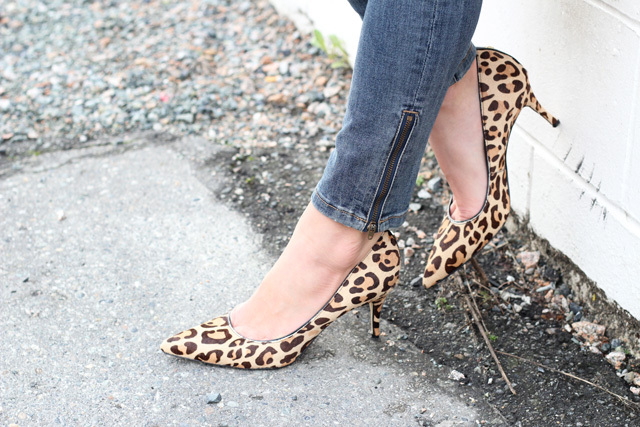 You outfit is perfection -- I adore those skinny jeans and the leopard heels. 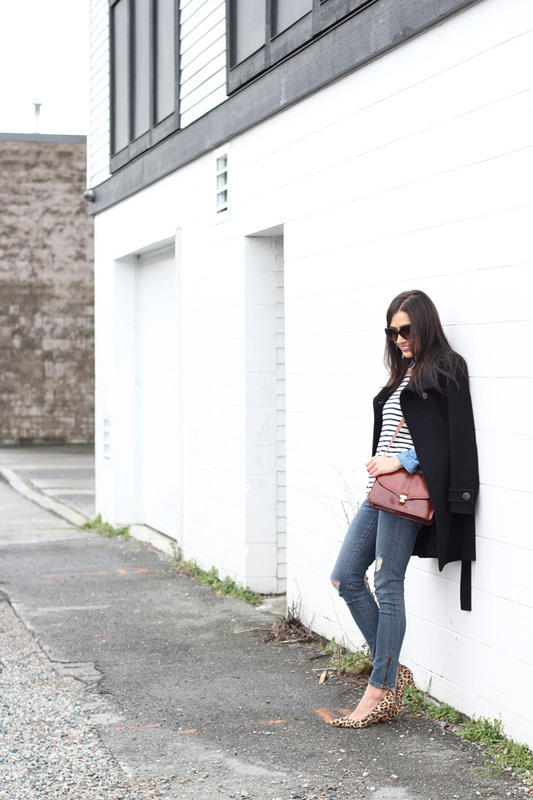 You did great job pairing vintage with modern, and that bag is so chic. Thanks Vanessa, it definitely is! 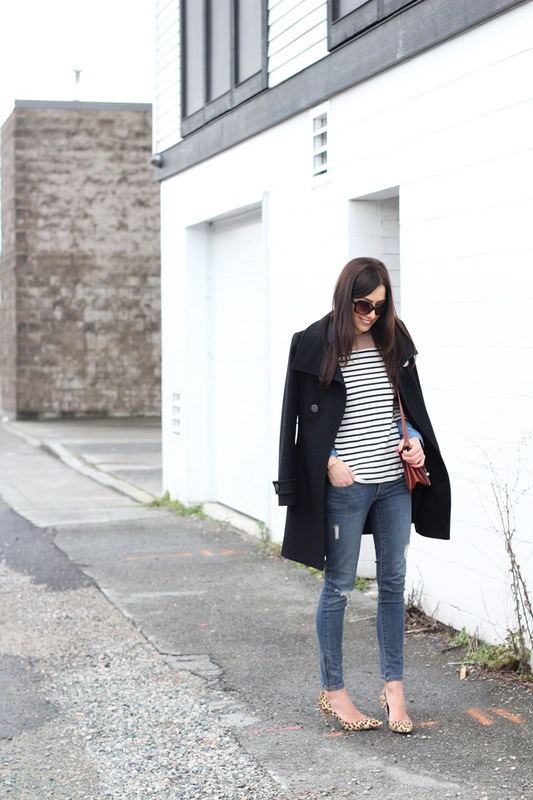 I've been wearing this skinny jeans quite a bit, but I just love the fit and how they work with so many outfits. I'll have to check out that subscription! 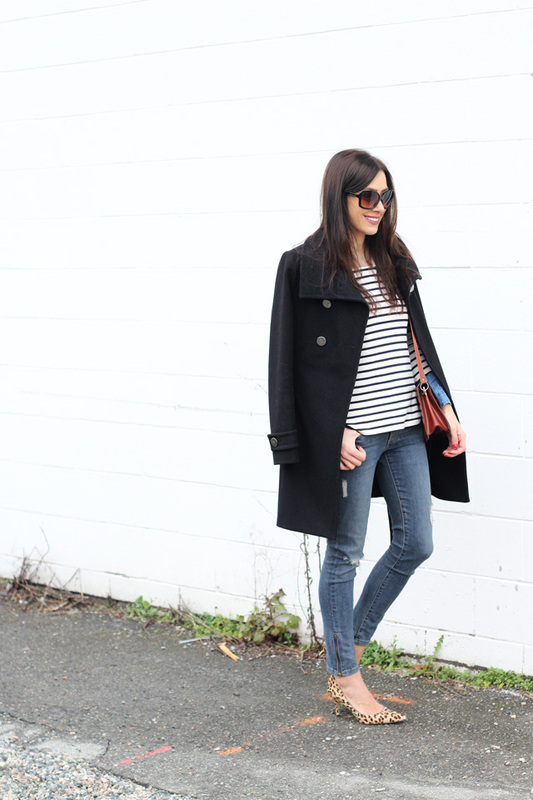 LOVING this outfit, the chambray, stripes and print shoes go perfectly together. Thank you Meagan! And yes definitely do! Really glad you like the look:-). Thanks so much for stopping by! Your purse is fabulous. I can't believe that is what came in your box. It looks so well made and I love the size. I never heard of this subscription box company before. Thanks so much for sharing it with us. Thanks Kathy! I know I was definitely impressed. The size is perfect to fit a small wallet, keys, and a couple lip glosses. Hopefully you'll check them out:-). Have a great week! Thank you Hanna! I got it a few years back, but it's been worn quite a bit since:-). 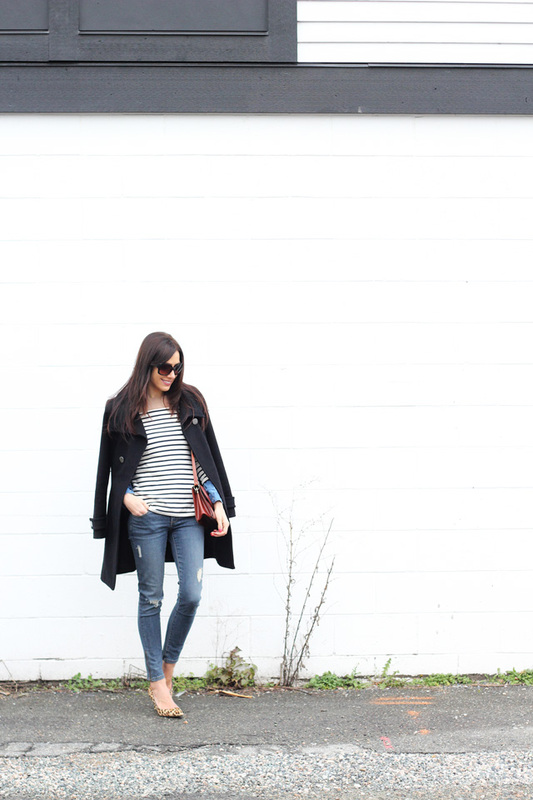 Can never go wrong with a classic black coat! Such a cute look! Happy New Year! This outfit is on point! Love it. Stripes and leopard has to be my all time fav combo! U look darling! Awesome photo's babe! I love the striped tee. 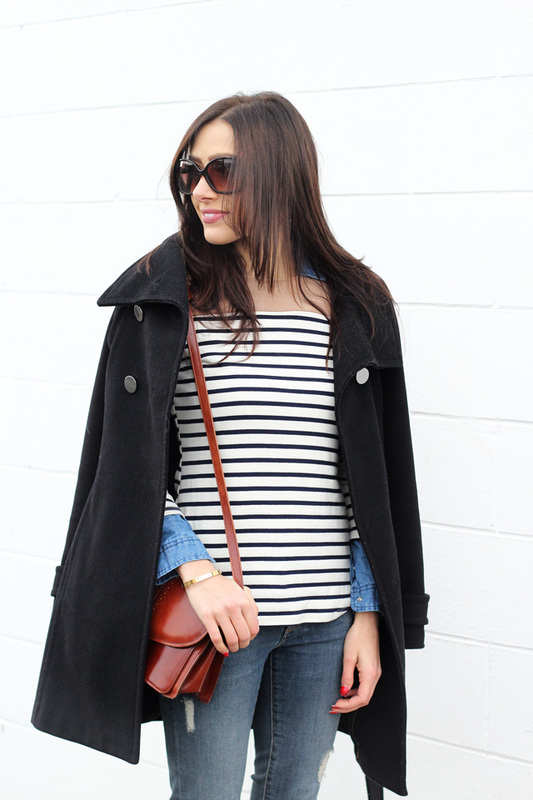 Chambray, stripes and leopard!!! Such a perfect combination of colors and patterns. I love your attention to detail! I hope 2016 is off to a great start for you, Ela! Have a wonderful weekend! Oh man, that camel bag is just unreal! What a find! Happy 2016, Ela! They definitely do! Glad to hear you also like to incorporate vintage pieces into your looks. Thanks so much for stopping by and have a great weekend! I love the classic look of this outfit! The vintage bag fits right in! Vintage pieces are timeless. Investing in them is a wise move! I didn't know there was such a subscription. Not only is this look completely fabulous, but that bag is amazing! I'm totally with you about styling vintage. Pairing modern pieces in the mix is the way to do it! Thanks Ruthie! Yay! You'll love it:-) Have a great weekend! Simply beautiful! love the leopard shoes! Thanks Rachel! Got a great deal on them and they're super comfortable!!! Always slaying your outfits. You look really pretty. I am really loving your jacket! So nice! Hope you had a great New Years! All the best in 2016!!! Thanks Lauren! I saw ur post on instagram and love how you styled them. Checking out your post now! I'm the same as you. I can't commit to dressing in a time period so I'll mix vintage with modern all the time. It's like giving the piece a whole new life! You look great girl. Happy New year! Yes definitely! I'm so glad u agree:-). That one vintage pieces really changes the entire look and I love that. Hope u have an awesome weekend Jeanie! Thanks so much! I'm such a fan of leopard and also can't get enough of this gorgeous purse:-). Have an awesome weekend beautiful! Gorgeous look from head to toe! I love your heels and purse! I love everything about this outfit, you look gorgeous!! It's amazing that they sent you a real leather bag and the bracelet is also so pretty!! Thank you so much Esther! I was very impressed with the overall quality of the bag and that it's real leather was a great surprise:-). Hope ur having a great weekend so far! Hi Ela, this looks wonderful and I love how you styled it. You look gorgeous! The purse looks great. What's inside the purse? Are there zippers and compartments for phone/keys/etc? I love it when there are things inside to help me stay organized! Thank you so much Jalisa! Your sweet comments seriously always make my day. You'd definitely love this vintage box subscription and I know you'd style them so perfectly. You have such a unique sense of style! Hopefully you'll get a chance to check out the subscription box soon :-). Have a great weekend! Bets wishes for a wonderful new year 2016! I hadn't heard about this until reading your blog, what a brilliant idea! The purse is so cute and I absolutely love how you styled it!! Have a wonderful weekend! Thanks Haley! Yeah it's definitely a neat idea and something I had no idea about until recently too:-). Let me know if u get a chance to try out the subscription box! You are so lovely Ela! You look amazing as always! Love the shoes! Such an amazing discovery, I had no idea there was even such a company in the UK, thanks for sharing, hon :) Such a fab idea! I love the purse you got, it's such a timeless piece. 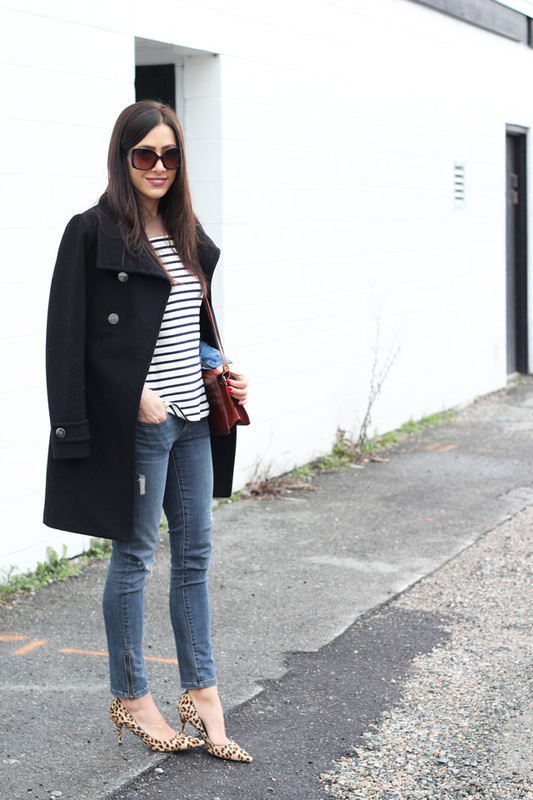 Leopard print shoes together with stripes = I am in love. You pull it off perfectly, babe.